The referee got it right this time. Unfortunately the referees don’t get it right every time, and soccer has no instant replay. As a result games often turn on “diving”—falling to the ground to make the ref think you’ve been fouled. Soccer should take the simple step needed to disincentivize diving: examine replays after the game. If the replay irrefutably shows a dive, the player would be suspended, the length of his suspension determined by the severity of his offense. Brazil almost won Sunday by diving; ironically the Brazilian men lost last year’s World Cup semi-final to the Netherlands when Dutch star Arjen Robben took a dive and was awarded a penalty kick, which gave Netherlands a 2-1 win and sent Brazil home. 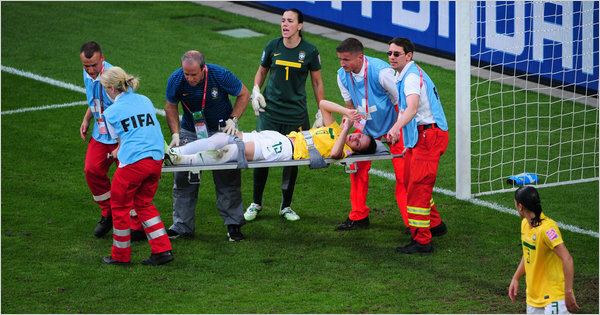 This year the Brazilian women were sent home because their own dive was punished. Soccer is too beautiful and important a game to have its games decided by cheating. Time to clean up its act. This entry was posted on July 13, 2011 at 7:40 pm and is filed under Ethics-general, Sports. You can follow any responses to this entry through the RSS 2.0 feed. You can leave a response, or trackback from your own site. Right on. This is one reason i dislike soccer…it has no integrity, much like basketball. Fake fouls and injuries have far too much influence in both. Locking them up would be good. I’d be satisfied if the Israeli government would crakk down, enforce the law, and kick them out of government.